The long weekend is almost here. But first, FWF! My favorite day of the work week is Friday, and my favorite part of Friday is Friends With Flair. 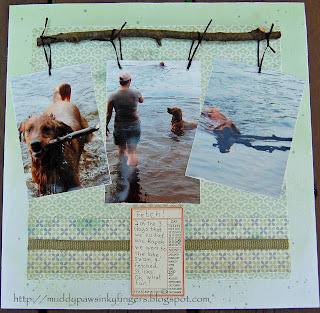 There is so much inspiration to be found when I visit all those linked up through the Unity blog. And, of course, there were some more great new Ippity releases this week. Will I ever have enough Unity? Nope. I have three cards to share this week. 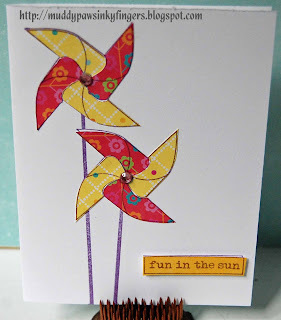 The first one is similar to a project I did as part of a tutorial for the design team I'm on. The theme was 'mosaic'. I made a mosaic heart out of washi tape. 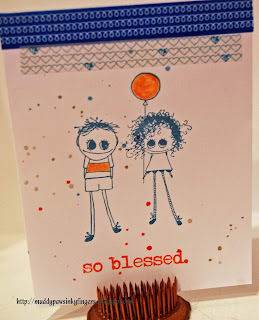 I used the same technique here on this card, then matched the colors with ink CTMH markers on the Unity sentiment. 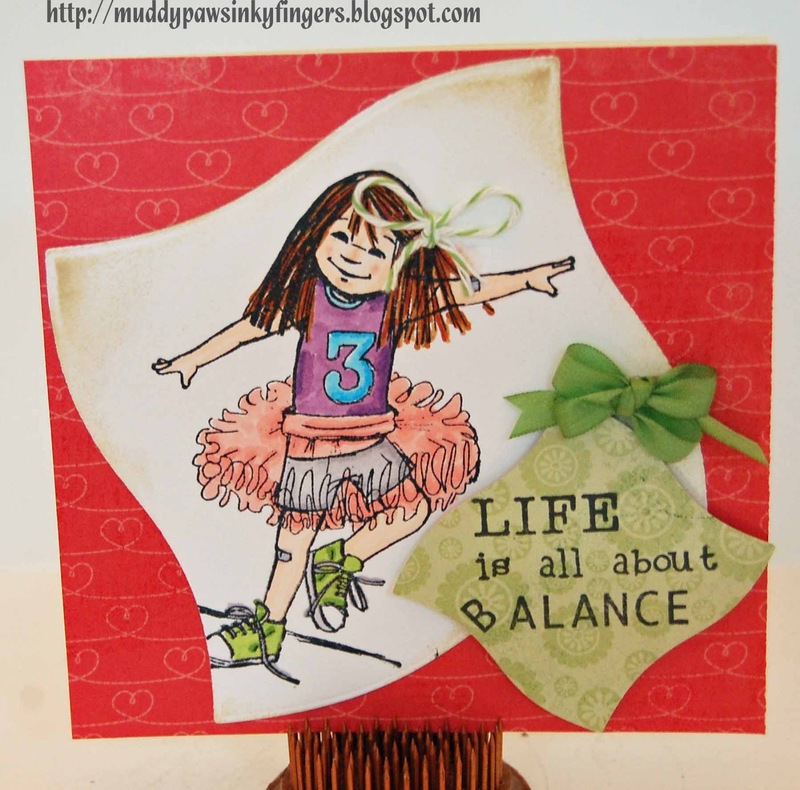 The sentiment is from a stamp of the week. The washi tape is from Target. I cut the heart shape out on the Cricut. The baker's twine was given to me as part of some great blog candy I won. 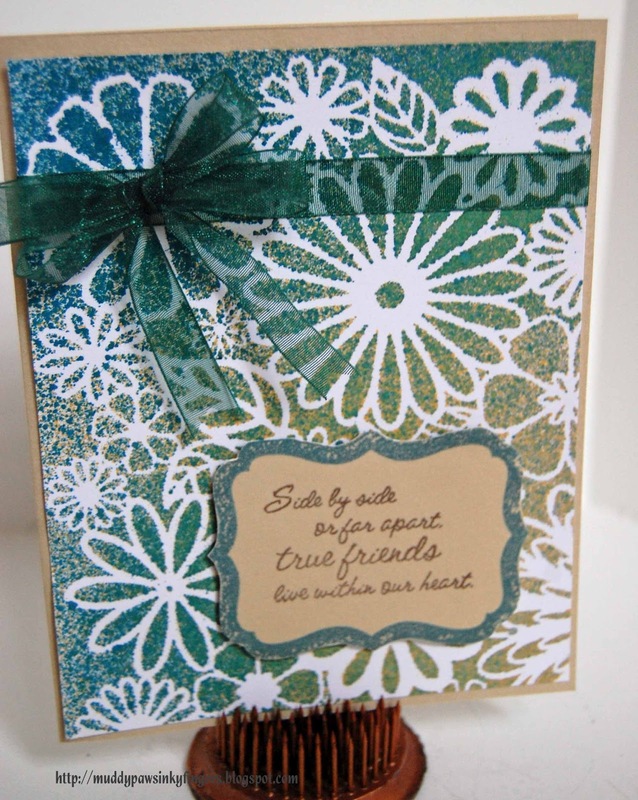 Cardstock is CTMH (a retired color). The next two cards are both using Copics. 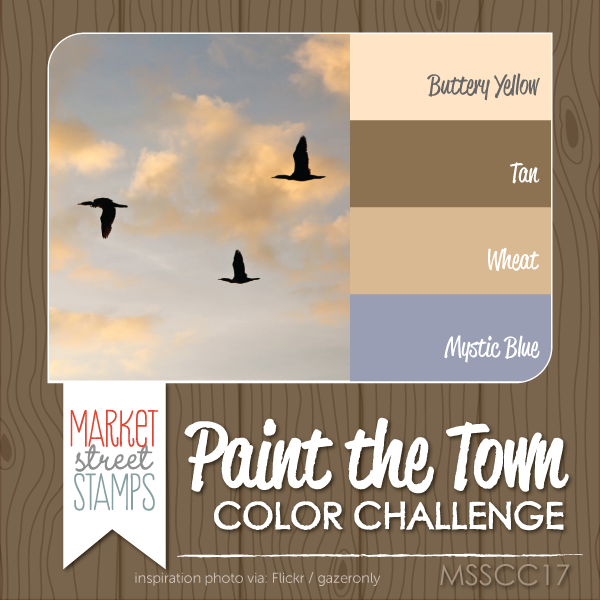 The challenge on cropchocolate.com this week is using shades of one color. Black and white are also acceptable. 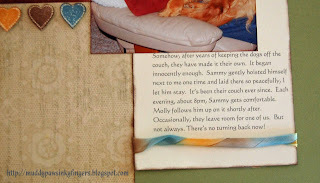 My husband and I had quite a discussion about this poppy card. 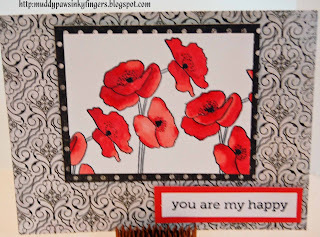 I wanted to add some black pearls either side of the sentiment, and some black Stickles to the centers of the poppies. He was adamant it was complete just the way it is. 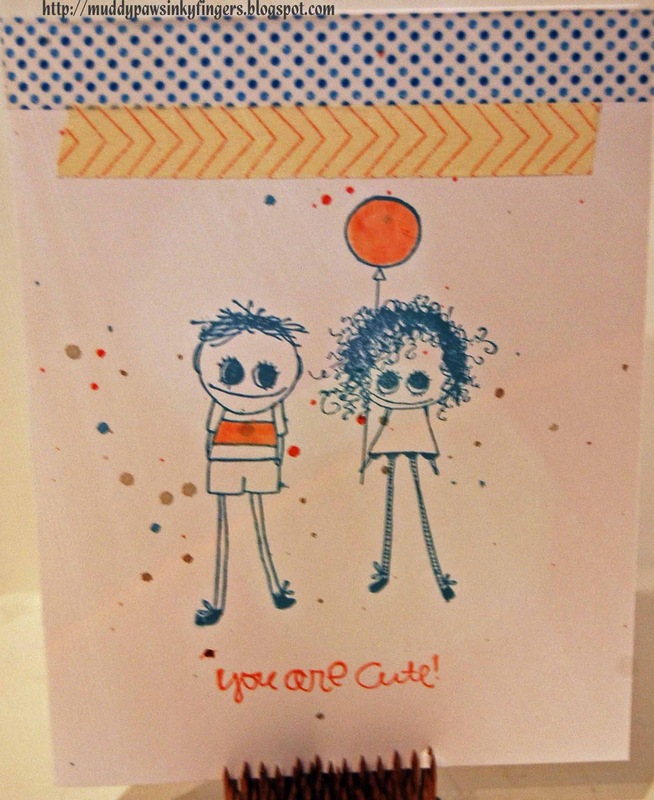 Since I made the card with him in mind, I left it the way he liked it and wrote a mushy message inside. I used MME Meadowlark 6x6 papers, a Hero Arts/Studio Calico stamp for the sentiment, and a free stamp I got from England for the poppies. The third card is all Unity and Phyllis Harris. I just love this little girl and the message she brings. I used Echo Park For the Record 2 papers, Copic markers, Tim Holtz distress ink (worn paper), baker's twine, and some white silk ribbon I won from May Arts. I dyed it with a Copic marker to match her shoes. Isn't she the sweetest thing? Enjoy your holiday weekend. Hope you find some time to ink up your stamps! I had yesterday off of work, and while our plans didn't go as planned (when do they? 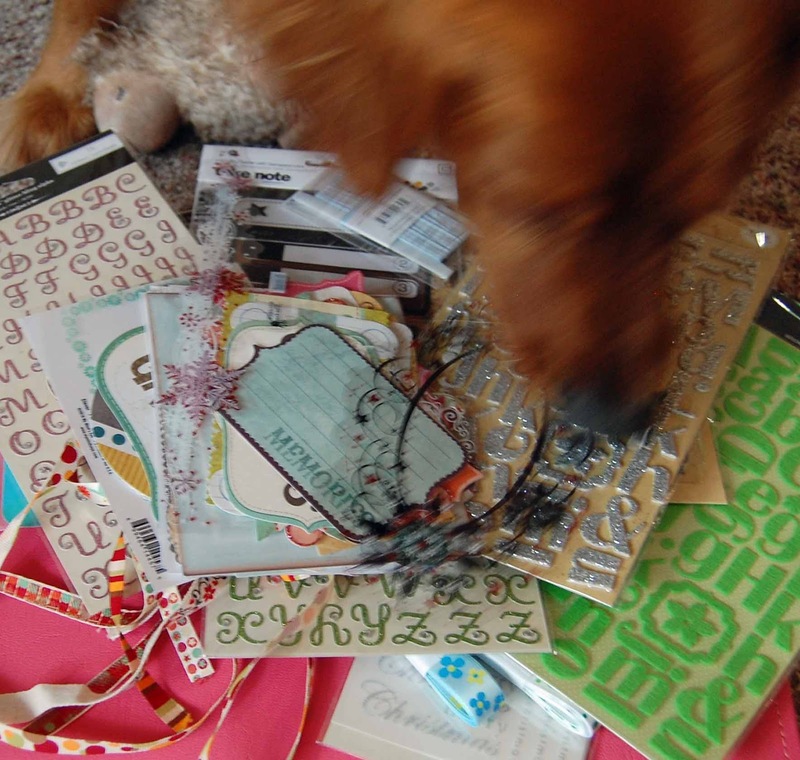 ), I did get lots of scrappin' time, so that was fun. My husband and I both took the day off of work hoping to take the Harleys on a long ride, but rain changed those plans. I'm going to share all my Thursday projects with you. Hang on, I was busy! I used Trinity Surf and Swim 12x12 papers. The base pages are Echo Park Wintertime. 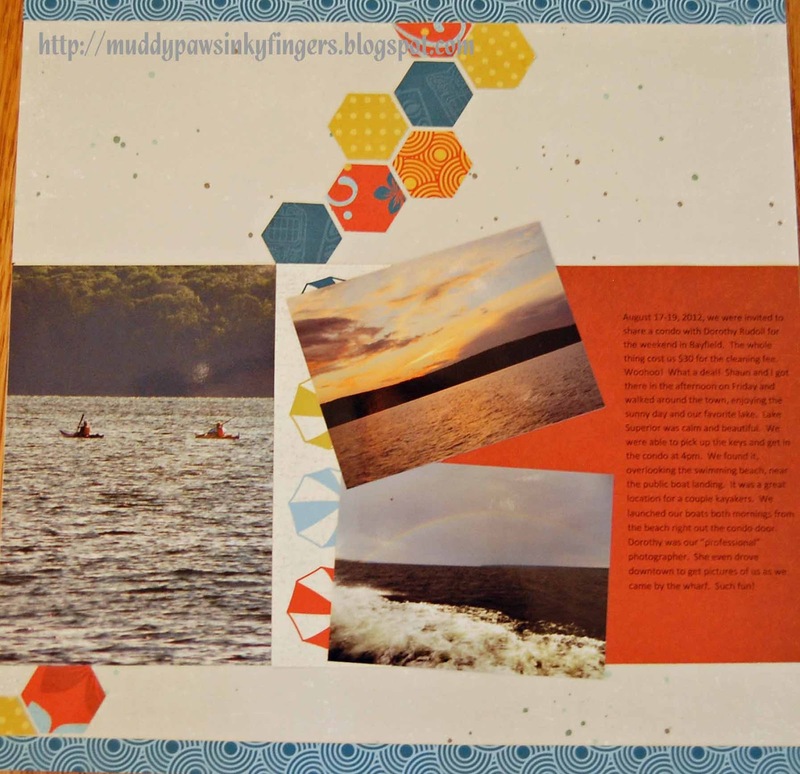 The hexagon punch is by Creative Memories. 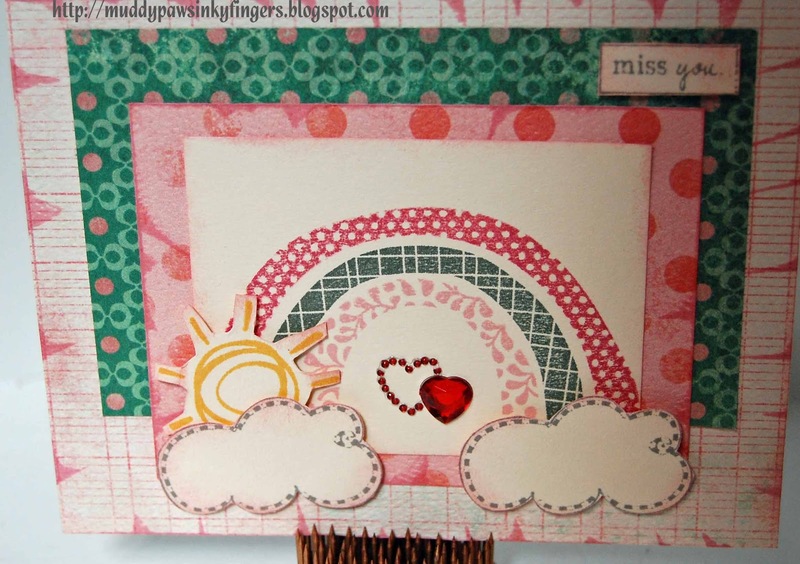 I stamped the word "memories" using the August 2012 SMAK kit, and the wave border stamp is by Close To My Heart. There's also some Mr Huey's flicked on each page. 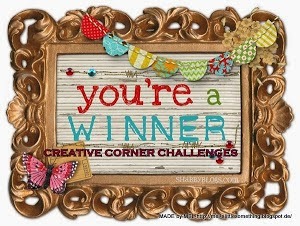 I am entering this is the weekly contest on Cropchocolate.com. This week's theme celebrates summer and has to have the element of water somewhere on the project. Here's project #2. I've been nervous to try Copics on a person and/or an animal, so when I got some new Unity stamps, I decided it was time to dive in and get it done. 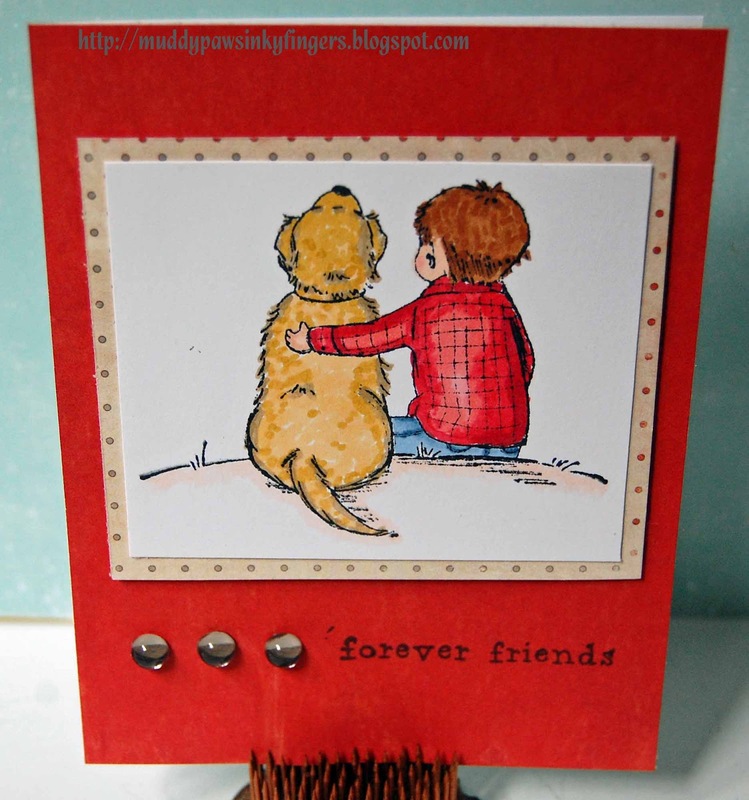 This is a Phyllis Harris stamp set, "Wishing We're Forever Friends". I used a 6x6 Authentique Carefree paper pad and the bling is from Close To My Heart. 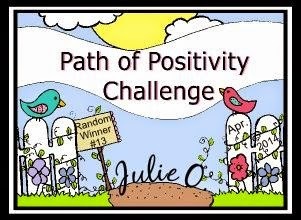 I'm going to enter this in the current Ippity Chick Challenge using this sketch. Papers are from the Echo Park 6x6 Summer Days paper pad. Bling is from my stash. 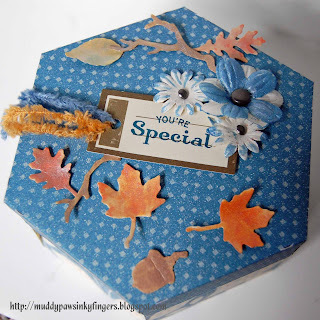 And lastly, I have a box I made for my BFF. I'm hoping to go stay with her for a couple days next week. 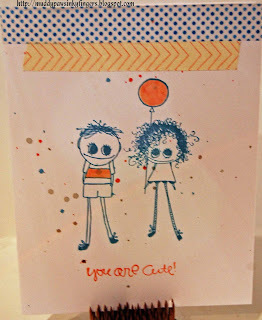 I used the new Close to My Heart Cricut Artiste cartridge. This is a fantastic cartridge! I didn't think I'd ever like a cartridge better than the CTMH Art Philosophy cartridge, but this is spectacular. You can purchase it from my website (link on the right) if you don't already have a consultant. I used Close To My Heart papers on it, a Tim Holtz die, distress inks mixed with water and Liquid Pearl, some paper flowers from my stash, also painted with Liquid Pearls, and a journaling tag and stamp from Close To My Heart. And, that was my fun day of play! 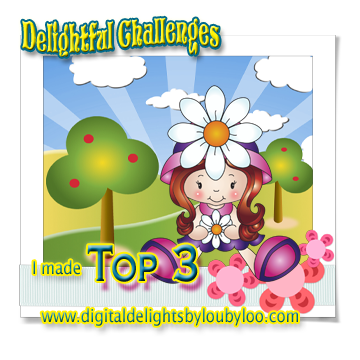 I made this card for the star themed challenge at Unity and the current Ippity Chick Challenge. 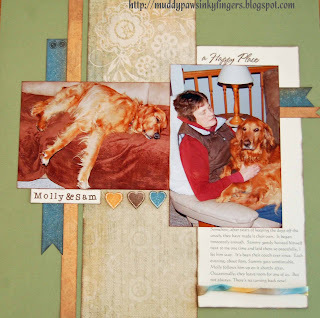 I used 2 Unity Kit of the Month's for this -- July and May (I think), 2012. Papers are MME Fifth Avenue. 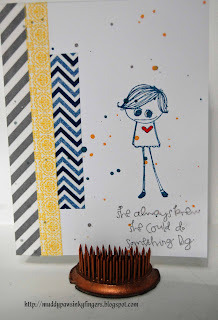 I won this 6x6 pad, along with some other coordinating goodies, from a friend's blog candy. I thought I should dive right in and use the papers. I also used a scalloped circle punch (CTMH) and 2 different sized star punches (Creative Memories). And, using the same paper pack, I made this card for a challenge put on by a couple scrapping friends. 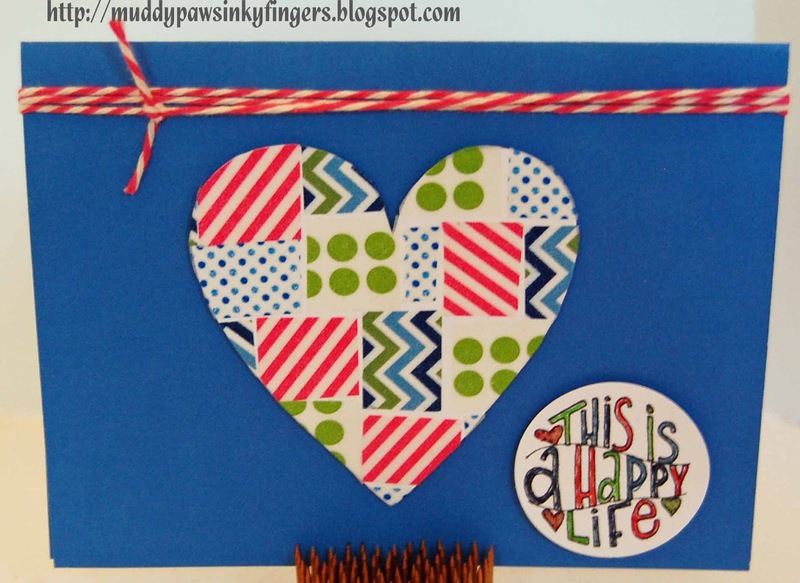 They each made a layout using a heart shape and papers punched in different sized circles. 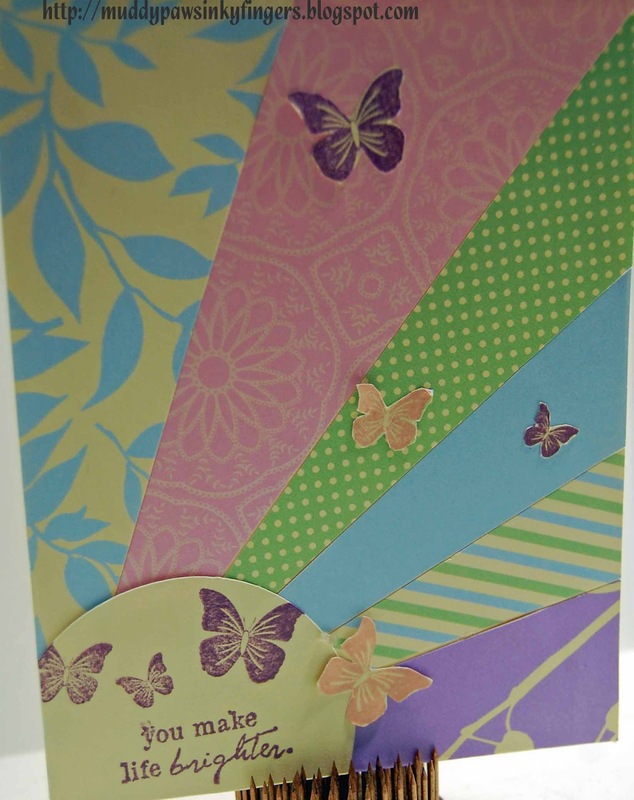 I modified it into this butterfly card. 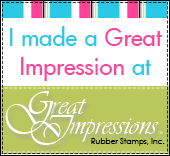 Thanks for looking at my creations! 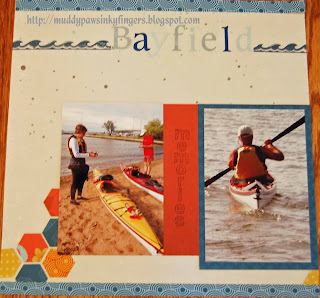 I'm leaving for a kayaking trip on Lake Superior this morning, so this will be a quick post. We're dropping the poor pooches off at a kennel, loading the kayaks, and heading North. Of course, the temperature has crashed the last couple of days so we'll probably freeze on the lake. Oh well. Such is the way of our vacations. On to Friends With Flair. I've been working on a 2-page layout that I finally got done. There's just a little itty bit of Unity on it, so I'm going to share it here. Be patient, and I'll show you where. And, here's where you can see the Unity. 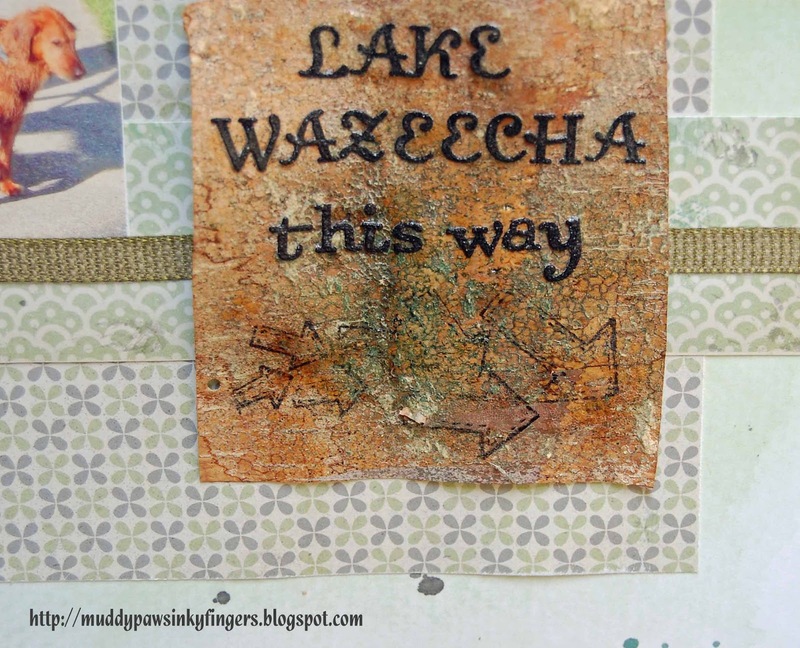 Most everything in this layout is from Close To My Heart -- paper and stamps, EXCEPT I added some texture to my title using Unity Bitty Background stamps. I dyed the ribbon different colors using ink pads. It was a new technique for me. Papers are MME Sophie Sophie Clever. 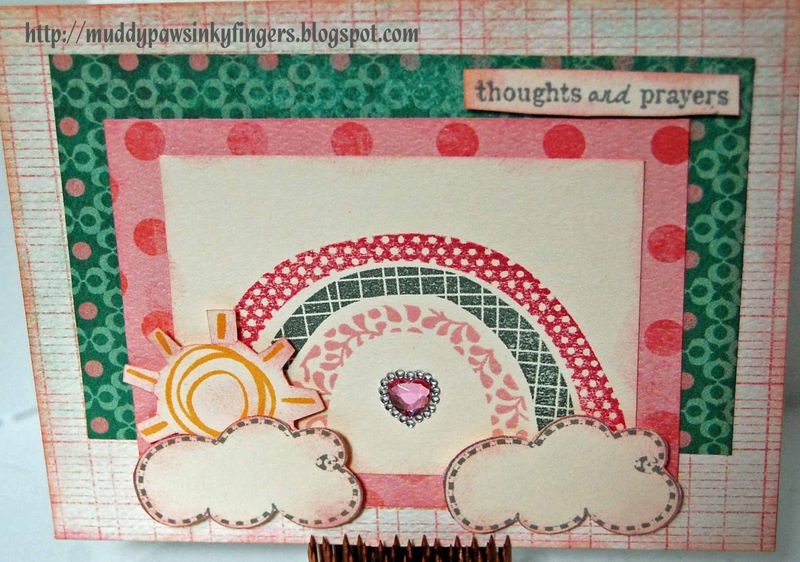 The rainbow & sun stamps are a retired CTMH set. 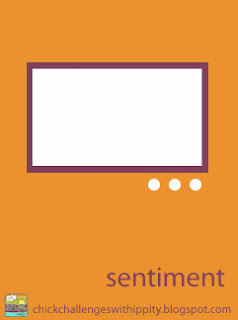 Clouds and sentiment are Unity. And, I'm off! I don't know if I'll have internet connection in the motel tonight or not. If I do, I'll check out the other great talent on FWF. 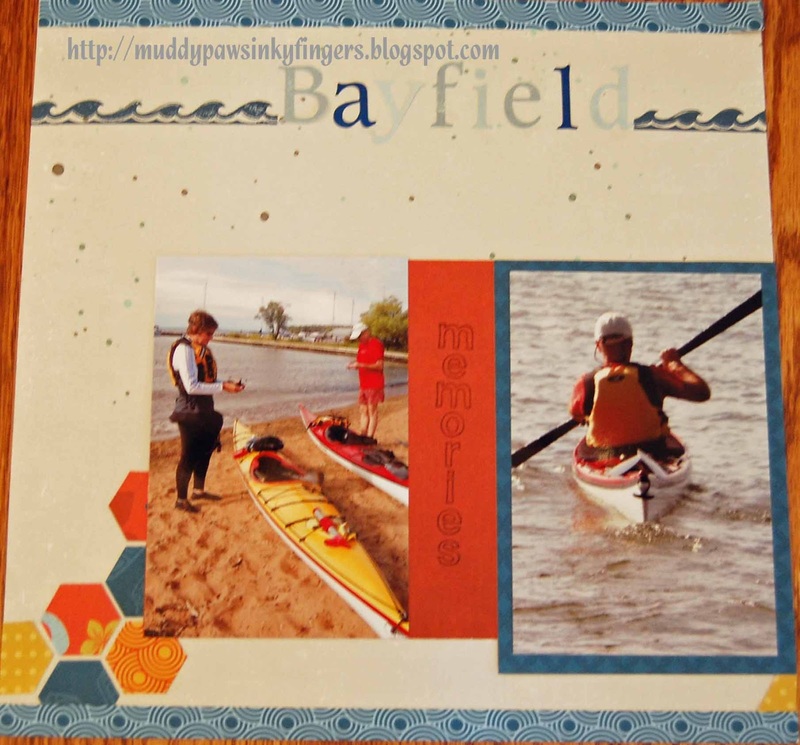 If not, know that I'm paddling and I'll catch you next week! I have a few Market Street stamps, but have not entered many of their challenges or participated in many of their neighborhood events. 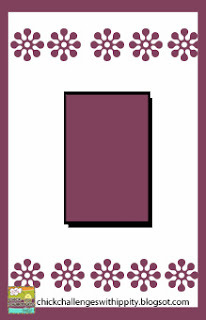 Since I had some free time last evening, I decided to make a card using this month's Paint the Town colors. The card uses Market Street stamps and Close To My Heart papers and ink. What'd ya think? Did I nail it? 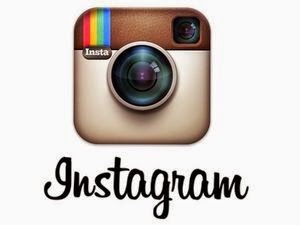 Leave me a comment and let me know. 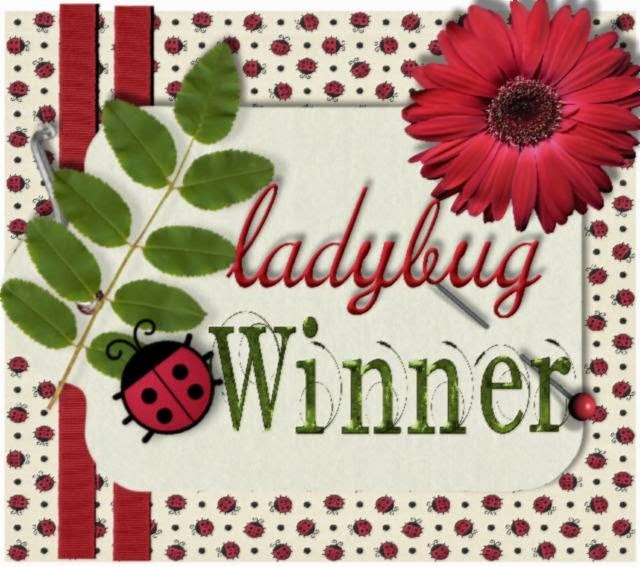 Thanks to everyone who visited my blog over the weekend. 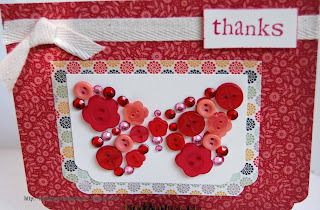 I loved all your comments from the Scrapbooksteals.com bloghop and am THRILLED at the new followers I have gained. 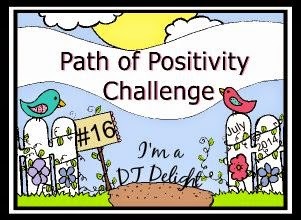 I hope you find inspiration here! Congratulations! Please contact me and I'll get your winnings sent out to you ASAP. 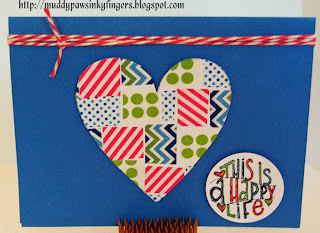 ScrapbookSteals.com blog hop, blog candy, Friends With Flair and more! I've been looking forward to this for a long time now! 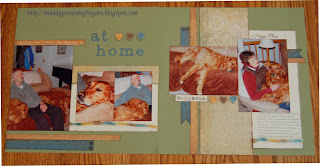 When Kristy of Scrapbook Steals gave me the opportunity to participate in the August blog hop, I was thrilled. Scrapbook Steals is one of my favorite places to get great scrapbooking goodies. I check their deal twice a day, just to see what great things are available. 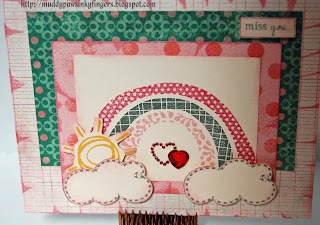 Then, when I found out I'd be playing with Mr Huey's Color Mist by Studio Calico, I was thrilled. Spray inks make me feel so artsy. I know you've seen lots of great techniques along this hop and seen some great colors of mists. My color is pinstripe, and as you might expect, it is a shade of gray. My dog, Sammy, is checking out the spread. He likes the ribbon the best. Hopefully, whoever wins it will agree with my boy. 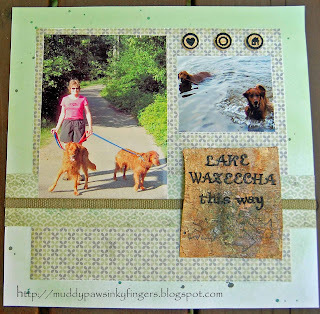 Now, to the projects I made with Mr Huey's Color Mists by Studio Calico http://scrapbooksteals.stealnetwork.com/archive_products.php?id=3002636. I played with these mists a lot on this 2-page layout. I flicked the Mr Huey on both background papers (My Mind's Eye Nostalgia paper used throughout the layout). On this piece of birch bark, I used the Mr Huey Pinstripe sprayed on, then dabbed with a paper towel. 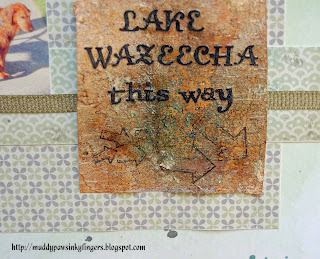 I let that dry, stamped with Stazon and a Unity SMAK kit stamp (01-12) to get the arrows. The words are stickers. 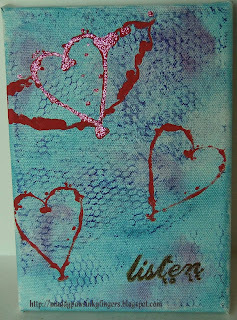 I then sealed the whole piece with Tim Holtz Rock Candy Clear Distress Paint. The ribbon is dyed with Mr. Huey's Pinstripe. Here's a look at just page 1. And, a better look at page 2. Yes, that really is a stick at the top of the page. My husband thought I was crazy when I was out in the yard, searching for the perfect 10 inch stick and piece of birch bark. But, I like the finished look. Now, on to some more misting techniques that I used on some cards. 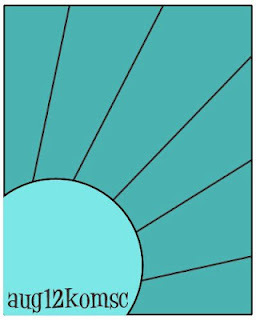 This first card, I used several more Mr. Huey colors -- Water Cooler and Sunshine. 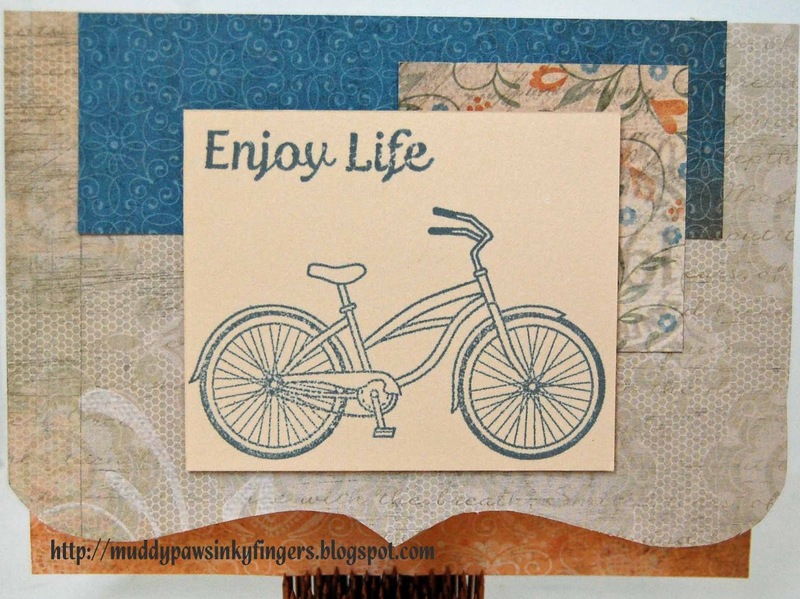 I used a Crafter's Workshop template and sprayed the inks heavily on white cardstock for the background paper, then placed the background paper on a Kraft card stock base. The sentiment is from Close To My Heart, as is the ribbon. One of my favorite ways to use spray inks is to remove the spraying mechanism from the bottle and just flick it on the paper. I seem to have better control with it that way. The next 2 cards use that technique. I call it the "flick" method. The next card uses Washi tape from Target and a great stamp from Unity Stamp Company. I love the simple lines of this girl, and the sentiment is priceless. And, finally, one more card, if you are still hanging with me! 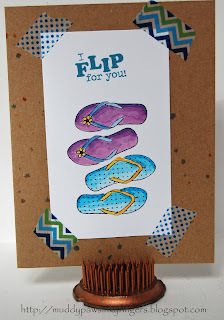 This last card uses the flick method again, and another Unity stamp that I colored with Copic markers. Plus, more Washi tape and some Kraft paper. PHEW! That was a lot to put you through. If you are still reading, you are loyal, my friend. 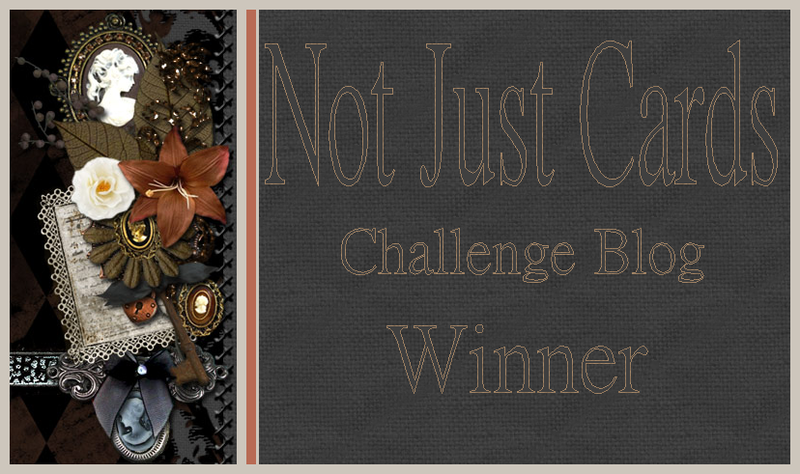 Remember, leave me some love and you'll be eligible for some blog candy. Just let me know how to reach you. Now, hop on to the talented Patricia. You'll love her contribution to this hop. 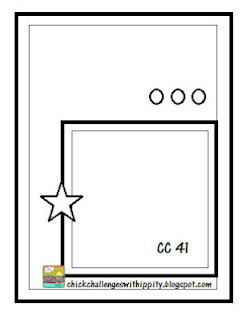 I'm using this card for 3 challenges -- Unity's Kit of the Month challenge, using a sketch; Ippity's challenge, using Itty Bitties, and cropchocolate.com's weekly contest with this week's theme of combining old and new. 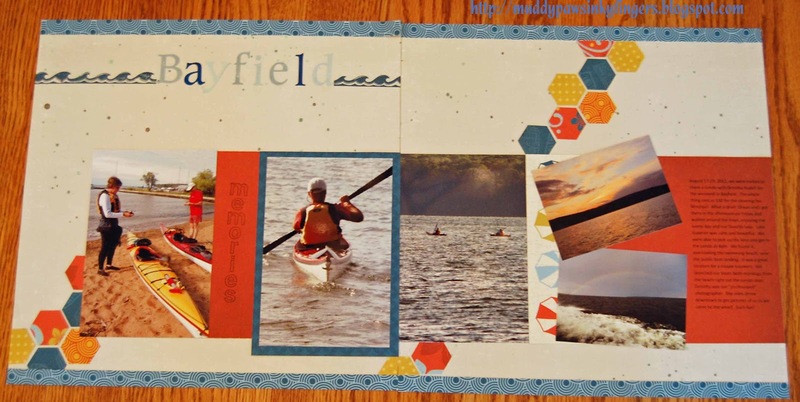 I've had some mat stacks by Making Memories for as many years as I've been scrapbooking. They were some of the first paper I bought. I dug the pastel stack out to make this card. I used the sunburst technique for the first time, so that was my "new" element for the challenge. 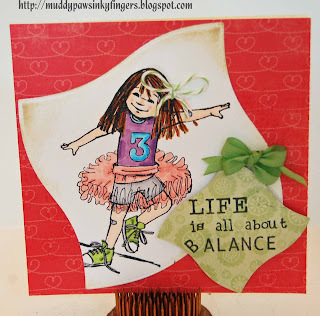 I used 2 Unity Itty Bitties: Direction of Happy (new) and Life Brighter (already inky). I enjoyed this sunburst technique, after I figured out a way to do it. I might have to try it again. 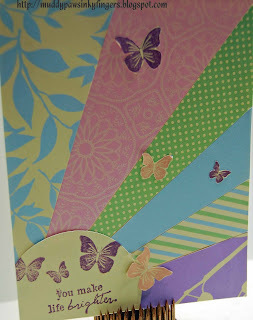 Some of the butterflies on the card were fussy cut and the wings were curled a bit to give a 3D effect. 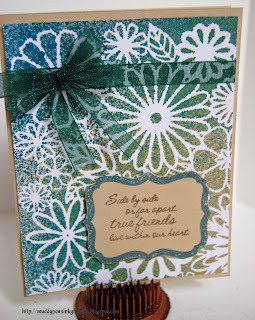 Close To My Heart ink was used in Gypsy and Blush. Thanks for looking! Come back this weekend -- I'm hopping with scrapbooksteals.com, and will have blog candy to give away. I'm so glad it's Friday! My BFF is visiting for a few days. 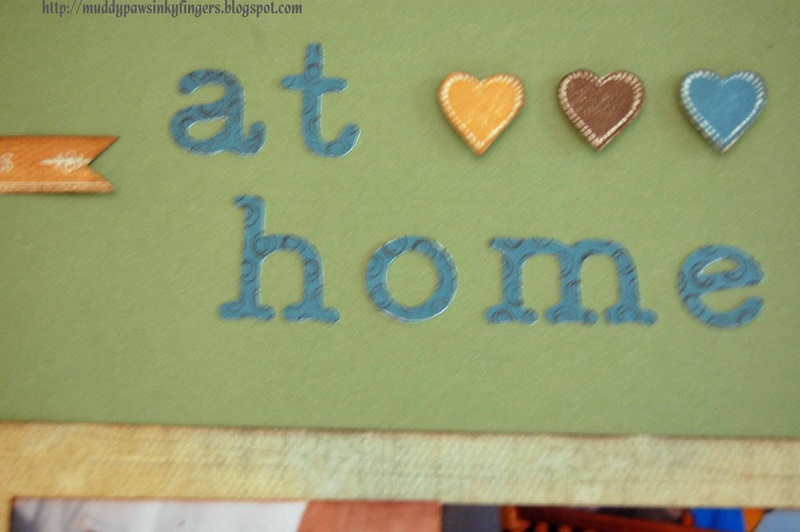 I made this for her to take home with her and hang in her craft room. 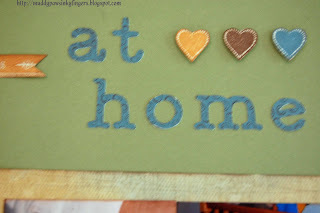 I have had some Tim Holtz distress stains for awhile but never found time to try them out. I used 3 of them on this canvas. I also used Angie Blom's Listen to Your Heart stamp set, and a Unity Chicken Wire background stamp. The heart in flight was blinged up a bit with Stickles. I used a Simple Stories stamp set to make the cards. The 'So Blessed' card is going to a good friend who treated me to lunch on her deck overlooking the lake today. 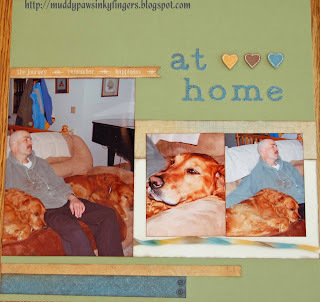 The other one goes to my 90 year old mentor whom I have known and loved for years. 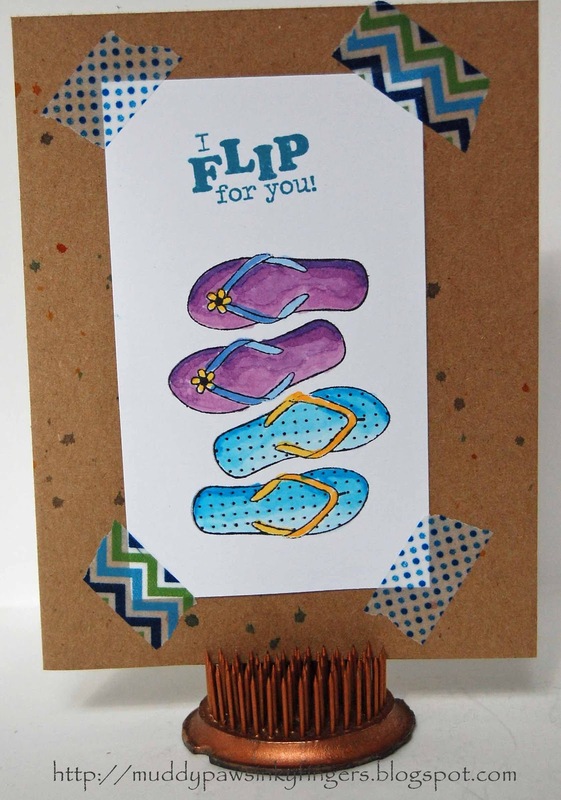 I try to send him a card every week. He thinks I'm the most talented thing to walk this earth. We all need a Milt in our lives. He will laugh at this card! Enjoy! 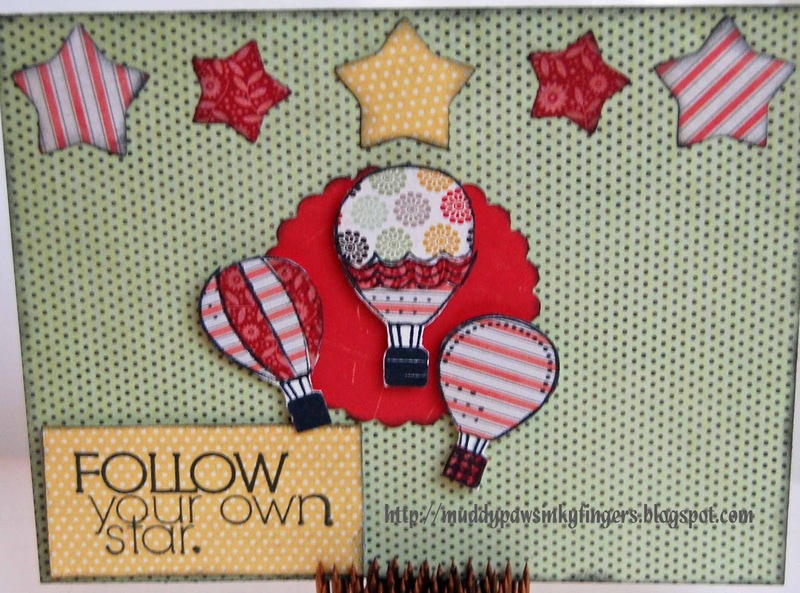 I used American Crafts Mixtape and charcoal baker's twine to make the banner and bows. The background paper is all Echo Park's Everyday Eclectic 6x6 pad. The stamps used are Unity Total Cuteness. 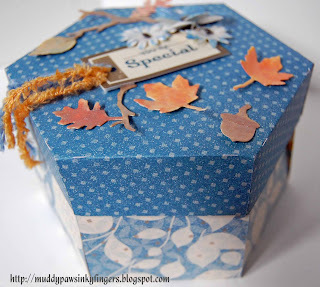 I used Spellbinders dies to cut the 2 squares, Close To My Heart ink and bling. I had planned to use Copic markers on the owl but decided I liked the black and white theme to coordinate with the bakers twine, and I liked the paper piecing look. Funny how often things turn out differently than what I see in my mind before I start. Thanks for looking at my card. I hope you enjoy it!